We had looked forward to the sold out show at The Little Fox Theatre for several months. What could possibly be better than sharing the music of the greatest band in the world with the greatest devoted and dedicated fans in the world! We recently had the incredible experience of having Gregg Rolie call in to the KFOX radio show while we were performing there live and give us his compliments. Shortly after winning the Last Band Standing Contest and being crowned the “Best Tribute band in Northern Ca,” we found out that Gregg Rolie had been booked to perform at the Fox Theatre right next door to us on the same night. Immediately all of us in San Francisco’s Ultimate Tribute to Journey began fantasizing about what if??? What if we were able to get Gregg Rolie, one of the founding members of Journey, to come next door after his show and sit in? WOW! Could that even be possible? After all, Gregg Rolie did say that our singer John Siino sounded more like Steve Perry than Steve Perry. Well, we all came to the conclusion that it would be great just to have Gregg Rolie in the same building next door and maybe we could actually go next door to meet him and watch him perform. But somehow the stars began to line up. First, I sent an email to Gregg Rolie via his web site asking if he might consider coming next door after his show and say hi to the 300 of the best Journey fans in the world. I also invited him to come up on stage if he felt up to it following his show. The night of our performance, management at the Fox Theatre came over and took us back stage to get a glimpse of the show. Malo was perfoming at the time, and they were great. We were standing there listening when I turned to my left and there was Gregg Rolie about 10 feet from where I was standing! And, yes, I did resist going over to him. Once again, I thought it was just a very cool thing to be in the same room with him. An hour later we were on stage performing to the packed house. Everyone in the audience was singing every song. It was, as always, a very emotional connection for us and the audience as we all celebrated Journey’s music. We were midway through Lovin’ Touchin’ Squeezin’ when I looked over to my left and there was Gregg Rolie standing there with a huge smile on his face as he was looking out at the crowd as they were all singing, “na,na, na,na,na, na,na,na,na na,na!” The crowd was waving their hands over their heads as they sang out loud, ever so proudly. 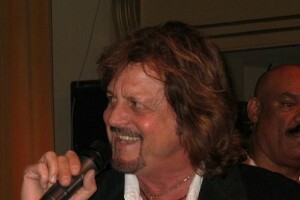 Time seemed to almost stop for me as I witnessed a very proud Gregg Rolie take in the emotions of the moment. He seemed to be reminiscing about his wonderful years with Journey. He then looked up at me on stage and nodded as if to say, “Thank you.” It was also a look that acknowledged that he felt that the music was in good hands and being performed for all the right reasons. For those of you who are married, you know the feeling when the bride’s father hands over his daughter to you, and there is a deep sense of trust and responsibility. Well, Journey is Gregg’s baby and the look he gave me was that he felt his baby was in good hands. I then remembered that I was in the middle of playing a song and re-focused on that. 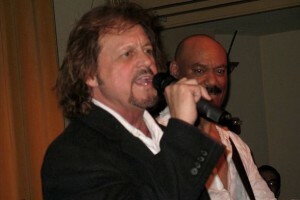 As we neared the end of the song I went over and motioned to Gregg Rolie to come up and sing with us. I had to ask him a couple of times before he agreed and walked up on stage. The crowd went crazy! He began to sing with us and the fans and again time slowed way down as I realized that our dream of Gregg Rolie joining San Francisco’s Ultimate Tribute to Journey on stage had come true. We finished the song and Greg was waving to the fans who were just going crazy. I quickly turned to our keyboard player whose name is also Greg…and motioned him to begin the song “Just The Same Way.” I turned to Gregg Rolie and whispered to him asking if he would stay for one more song and he said that he really had to go. 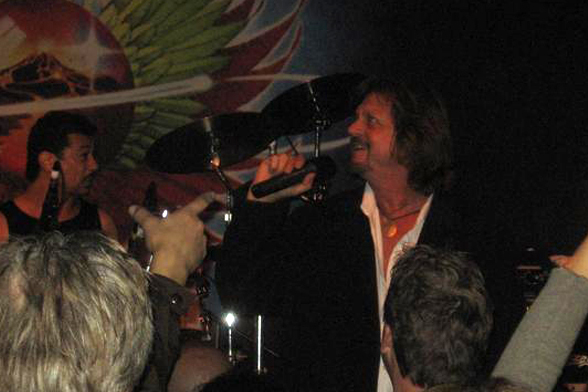 When our keyboard player began the song that Gregg Rolie himself wrote, well, Gregg just turned to me and smiled. I knew we had him! He turned to the audience and announced, “One more song.” He sang the song just as he had on the album many years ago. It was unbelievable! I have never felt so connected to Journey as I did at that moment in time. It truly is the highlight of my musical career. Thank you Gregg Rolie and thank you Journey!